The Order page allows you to view and manage all of the details associated with a processing or shipped order. This includes the order's items, shipments, returns, and more. Delay order: This allows you to change the status of the order to Delayed, which indicates to all users that the order should not be fulfilled immediately. Cancel order: This allows you to change the status of the order to Cancelled, which moves the order to the Archived tab and indicates to all users that the order no longer needs to be fulfilled. Reset order: This allows you to reset the order status to Not Started and clear all picking and shipping progress that has been made so far. Stop order: This allows you to change the status of the order to Partially Cleared, which indicates to all users that the order's picking process is still in progress and should be resumed soon. Force order: This allows you to skip the item verification process and change the status of the order to Cleared, which indicates to all users that the order has been picked and is ready for shipment. Note: this is not necessary if you wish to skip picking and ship the order right away - it is simply a way to communicate to other users that this order is ready to be shipped even though the items were not verified in SKULabs. Edit order: This allows you to make changes to the order's address, customer information, items and more. Note: Editing an order from a sales channel will convert it to a manual order after the changes are saved. Manual orders aren't connected to any sales channels, so they will no longer communicate order changes to or from your stores. Revert order: This allows you to revert the order to its original state. This is useful if you had previously edited the order (see above) and wish to reconnect it to its sales channel. Ship order: This allows you to create a shipment and print shipping labels for the order. Any memorized or rule-based shipment settings will automatically be applied. Mark as shipped: This allows you to mark the order as shipped on its sales channel. Depending on your sales channel configuration, this may send an order shipment notification to the customer without any tracking information, since a shipment was not created when the order was marked as shipped. Add manual shipment: This allows you to create a manual shipment for the order. A manual shipment is one that does not involve getting rates and paying postage within SKULabs. This is commonly used for carriers that SKULabs doesn't support, such as freight or LTL couriers. Note: In most cases, you'll want to adjust the item Quantity fields to make sure that the order items are deducted from inventory. Inventory overview: This tool allows you to see the inventory status of each item in the order. You can see at a glance if an item can be fulfilled based on your current on hand inventory, as well as the fulfillment and shipping progress of each item. Reconcile inventory: This tool allows you to quickly deduct an item's on hand inventory from the item's first available location. This is useful if you encounter an inventory discrepancy during your order fulfillment process. Scan history: This allows you to see some data on the item scans that have occurred on this order so far. You'll see which items were scanned, which users scanned the items, and when each scan occurred. Send e-mail: This allows you to quickly send an email to the customer. You can use templates such as shipment notifications, backorder alerts, and more. View customer history: This allows you to quickly see previous orders from the customer. To see more details of a given order, select its order number from the list. Convert to manual order: This allows you to quickly convert the order to a manual order. Note: Manual orders aren't connected to any sales channels, so they will no longer communicate order changes to or from your stores. Print packing slip: This allows you to quickly print a packing slip for the order. You can customize the packing slip template per sales channel on the store's settings page. Print combined documents: This allows you to quickly print a packing slip and a shipping label for the order from the same printer. This is handy if you use a label printer for the packing slip as you do the shipping label, as it saves you the extra steps involved in printing each document separately. Print commercial invoice: This allows you to quickly print a commercial invoice document, which has fields for each item's weight, tariff, origin, and more. This is especially useful in certain international shipping situations since it provides important information for customs and for freight forwarders. Print item barcodes: This allows you to quickly print out barcode labels for each item in the order. In the printing dialog that appears, you can choose the quantity of each barcode that you wish to print, as well as the barcode and label templates to print with. Print order barcode: This allows you to quickly print out a barcode label for the order. When this barcode is scanned on the Processing Orders tab, the order details page will be opened automatically. In the printing dialog that appears, you can choose the quantity of the barcode that you wish to print, as well as the barcode and label templates to print with. Print invoice: This allows you to quickly print a sales invoice for the order. You can customize the invoice template per sales channel on the store's settings page. Print address label: This allows you to quickly print out an address label for the order. This is the preferred way to ship parcels for many local postal services around the world. Previous order: This will move to the previous order in the Processing Orders table as it was configured before you entered this order. Next order: This will move to the next order in the Processing Orders table as it was configured before you entered this order. The Order page is broken down into panels. Each panel presents a different type of order fulfillment task, or to information related to the order. Those panels are outlined on this page, and are listed in the order in which they appear on the Order page. Batch #: The batch that this order belongs to, if applicable. Type: The difficulty rating of the order, indicating whether SKULabs considers the order to be simple or complex. This is often used for assigning orders to users of different experience levels, especially when configuring batch fulfillment settings. Status: The current fulfillment status of the order. This indicates if the order has been opened by another user, if it has been cleared (meaning the items have been picked and verified), or if it has been shipped in full or in part. Tags: Custom tags can be created and added to orders, items, or kits. Tags can be labeled however you choose, and can be used for various organization needs. Address: The customer address that the order is to be shipped to. The icon at the end of the address indicates whether it is a residential, commercial, or international destination. Requested Method: The shipping method selected by the customer when they placed the order. Shipping: The amount paid by the customer for shipping. Discount: The amount discounted from the order, if applicable. Tax: The amount paid by the customer in sales taxes, if applicable. Total: The total amount paid by the customer, including shipping and sales tax when applicable. The Notes panel allows you to see all of the notes that are associated with this order. Depending on the order's sales channel, these notes may or may not be visible to the customer. From here, you can add a note to the order, edit the order's tag(s), or automatically add a new tag based on your user settings. The Items panel allows you to see all of the listings that were purchased in this orders, as well as the item or kit for each listing. Each listing row will indicate the listing name, SKU (if available), quantity ordered, and total price paid by the customer. The item rows for each listing will indicate the item's name, SKU, and barcode, any tags associated with the item, the location it can be picked from (or a dropdown of available locations), and the quantity ordered. The Shipments panel allows you to see all of the shipments (if any) that are associated with this order. Each shipment row will indicate which user created the shipment and when, the shipment's weight, dimensions, method, postage cost, and tracking number. To track the shipment, you can often click on the linked tracking number (depending on the shipping method and carrier). To view more details for a shipment, select details on that shipment's row. To create a new shipment for this order, select Add. 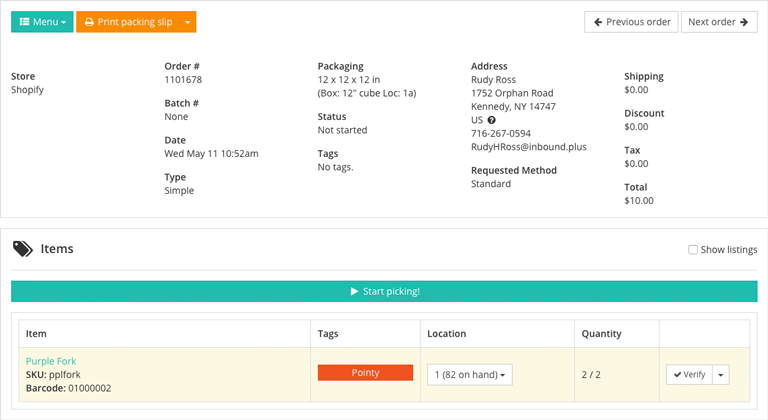 To reprint a shipment's label, toggle the checkbox on each shipment's row, then select Print. To void a shipment, toggle the checkbox on each shipment's row, then select Void. The Returns panel allows you to see all of the returns (if any) that are associated with this order. Each return row will indicate the RMA number, creation date, and whether or not the return has been received yet. To create a new return for this order, select Add. To reprint a return's authorization form, toggle the checkbox on each return's row, then select Print. To remove a return, toggle the checkbox on each return's row, then select Remove. Returns in SKULabs are primarily for inventory management purposes. Creating a return does not send a return label to the customer or charge postage from your shipping carriers. To create a return label, select Create return label and fill out the shipment information. You can then print out the label to send to the customer, or save it as a PDF and attach it to an email. The Fulfillments panel allows you to see all of the Amazon fulfillment orders (if any) that are associated with this order. Each fulfillment row will indicate which user created the fulfillment order and when, the processing status, the tracking number for the shipment, and the last recorded update to the order. To create a new fulfillment order and submit it to Amazon, select Add and fill out the fulfillment order information. You can check the fulfillment cost for the order by selecting Rates in the Add Fulfillment dialog, or submit the order with Fulfill. To cancel a pending fulfillment order, select Cancel. The Purchase Orders panel allows you to see all of the purchase orders (if any) that are associated with this order. Each purchase order row will indicate which user created the purchase order and when, the purchase order's number and distributor, and the purchase's current fulfillment status. To create a new purchase order, select Add and fill out the purchase order information. Purchase orders will automatically be separated for multiple distributors. The Log panel allows you to see all of the recent fulfillment activity for this order. Recent fulfillment activity for this order are listed in a table, with rows indicating what changes occurred and by whom. You can search for changes by the type of change, the date that the change was made, or by the user who performed the action.